You are welcome to print material from this website for use in your classroom. This is my second review of a CPR Call Blocker product. Their products block the calls you don’t want to receive on landline phones. 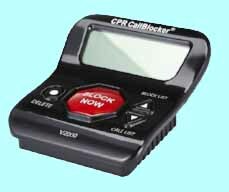 It sounds like a promise that can’t be kept but their newest unit, the CPR Call Blocker V10000, can actually block every unwanted caller so you only receive calls from the people on your allowed list. 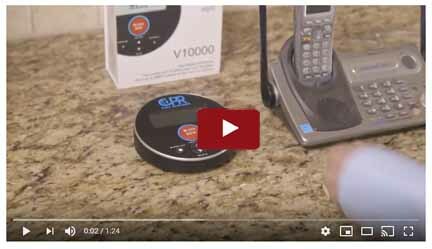 The digital ink was barely dry on my review of the V5000 when I received an email from an executive at CPR and he wanted to know if I would like to test their newest product that just went on sale one year ahead of schedule . If you have recently read the V5000 review you can scroll down to see a comparison of these two CPR units call blocking abilities. 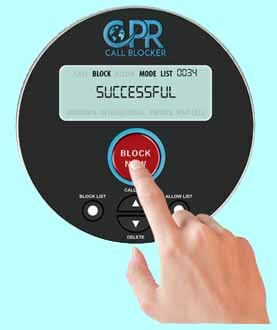 These CPR Call Blockers make it easy for you to block calls if you have caller ID from your landline provider. Caller ID is required for the product to work! Both units are compatible with all major USA landline providers. Both units are shown next to each other in photo 1. The installation process is the same for both units. You plug the telephone wire, the wire from the wall, into the line port of the call blocker and then plug the wire that was previously going to your telephone into the “Tel” port on the call blocker. See photo 2. If you follow this installation you will need to perform all blocking functions on the phone that is wired to the call blocker. This is great if all your landline phones are part of a cordless phone system because wiring the CPR call blocker at the systems base station will allow all the wireless phones to block calls. If you also have a number of old Ma Bell phones you might want to wire in the CPR call blocker using my approach. I wired the CPR call blocker at the location where the house phone wiring connects to my cable provider’s optimum router. 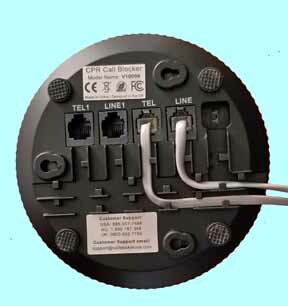 By wiring a call blocker in this way all the phones in my home can now block nuisance calls by pressing the # key and then the number 2 on the phone’s keypad after you answered the call. What makes the V10000 superior to the V5000 is you can set it so all phone numbers not on your allow list are automatically blocked and you can also add phone numbers to your allowed or blocked list using your phone’s keypad. The blocking of all calls noton your allow list is the perfect feature if you have an aging parent that is easy prey to callers trying to sell them the Brooklyn Bridge or scare them that they owe money to the IRS. 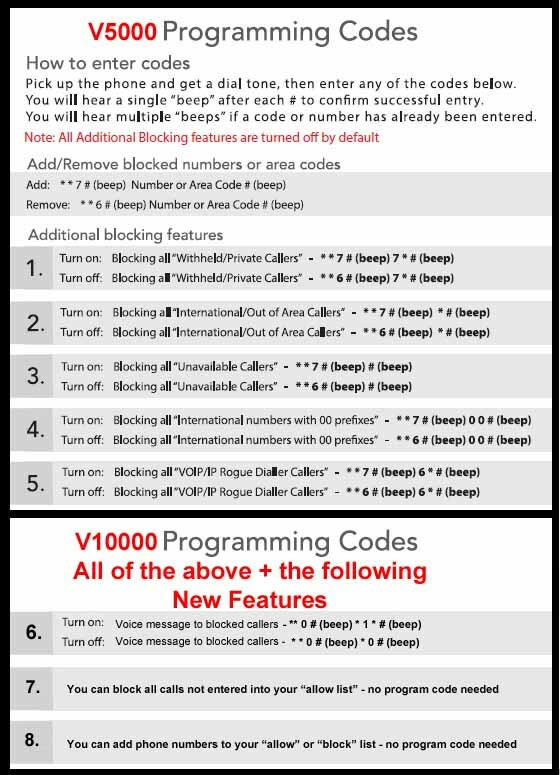 The third feature only available on the V10000 is you can program it to play a recording that tells blocked callers they can’t reach you anymore. You simply block numbers using your phone’s key pad, entering codes on your telephone to block an entire category of calls, and/or pressing the red button on the call blocker. Using the VOIP/IP Rogue Dialer code will reduce the spoofed phone numbered calls but it didn’t eliminate all the unwanted callers that needed to be blocked individually. When a call comes in, your telephone’s caller ID indicates a call is coming but your phones remain silent. It takes two rings for the V5000 or V10000 to determine if the number is a number you blocked before it hangs up on the incoming caller. If the call is not on the call block list, or a blocked category of calls your phones will start to ring. The people who normally call you will need to know that it will take you, at minimum, 3 phone rings before you are aware a call is coming in. Pre-programmed numbers are instantly blocked and don’t even show up on your caller ID. Video - This YouTube video shows standard setup.